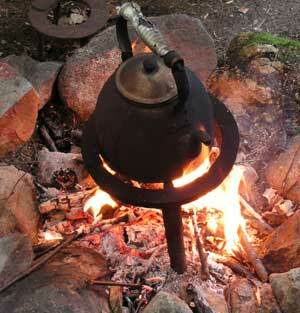 Come and celebrate Midsummer in the Finnish countryside! Enjoy the bright summer nights at the beach of M�ntyj�rvi. Enjoy a Midsummer sauna with the smell of fresh birch and a bonfire to admire. Accommodation double room �62,00/night. The price includes bed linen and one sauna. Breakfast and other meals can be served at additional costs. The Vaikkojoki river is a waterway of around 50 km in length, beginning in Juuka and finally flowing into the Kärenjärvi lake in Kaavi. The river continues for a further 20 km as a chain of lakes, to finish in the Kaavinjärvi lake. The route comprises around forty sections of rapids and fast flowing water. The whirls of water through the rapids provide great sport for the canoe enthusiast. Local businesses also organize descents of the rapids by boat (for groups) , an experienced guide at the steering oar. There are good mooring places along the river band where rambling routes are also marked. Every year the rapids are stocked with trout to provide sport for the fishermen. A fishing permit for the Vaikkojoki route can be obtained, e.g. from the local tourist enterprises. This entitles you to spinning, casting and fly fishing in the river and rapids. 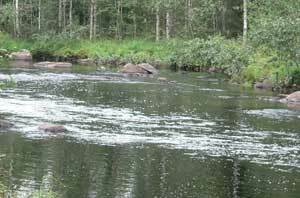 Vaikko travel is a cooperation of several tourist enterprices in the Vaikko river area. Our main purpose is offer a high quality holiday experience in a beatiful nature area. By combining the products of different companies, we can offer tailer made packages for our guests. An additional purpose is to stimulate the preservation of the area by information and education. 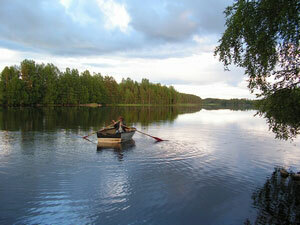 We can also arrange things like fishing permits, canoe hire or a rapids shooting trip over the Vaikko river.